C. F. Martin 0-18 Model Flat Top Acoustic Guitar (1959), made in Nazareth, PA, serial # 167314, natural lacquer finish, mahogany back, sides and neck, spruce top, rosewood fingerboard, black tolex hard shell case. This is an obviously well-loved and heavily played Martin 0-18 from the 1959, the year when the runaway success of the Kingston Trio launched the "Folk era" into the popular imagination and made the Martin guitar the height of fashion. The mahogany body carries the traditional features including tortoise celluloid binding on the body edges, tortoise celluloid pickguard, long-saddle Brazilian rosewood bridge and a nicely ambered nitrocellulose lacquer finish. The headstock corners are the rounded style typical of the period, with the peghead face adorned with the "CF Martin" gold decal on the face and individual Grover Sta-Tite G98 openback tuners with hexagonal bushings. 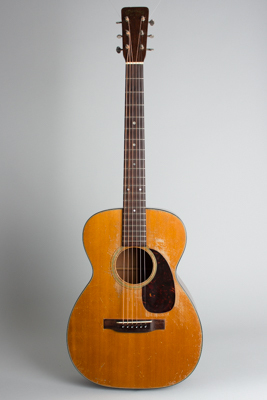 This guitar, like all made prior to 1964, is the product of the "old" red brick Martin factory, before the move to the modern facility down the road that year resulted in many changes in the way the guitars were made. These small body 0's are lovely-sounding instruments; this one has plenty of volume (more than many expect in a smaller guitar) and a well-balanced ringing tone. This is a superb-playing and sounding guitar, showing the signs of decades of heavy use but still a wonderful player's instrument. Overall length is 38 3/4 in. (98.4 cm. ), 13 9/16 in. (34.4 cm.) wide at lower bout, and 4 1/4 in. (10.8 cm.) in depth at side, taken at the end block. Scale length is 24 3/4 in. (629 mm.). Width of nut is 1 11/16 in. (43 mm.). This is quite a well-worn guitar but a great sounding one, richer with more punch than many 0-size guitars from this era. If a wear on a Martin bothers you, then this is one to pass on. The top has heavy pickwear around the soundhole and pickguard, and the finish overall has a varied collection of dings, scrapes and dents. The top has only one old spruce grain split off the bass side of the fingerboard; the sides have a repaired grain cracks on each lower bout. The neck has just been reset and playability is excellent. This is a genuine relic of a small-body flattop, already played for 60 years and ready for the next century. Very Good + Condition.